Meghianna was chosen as the next Queen of Snows before she was born. Megassa, her sister, should never have been born. 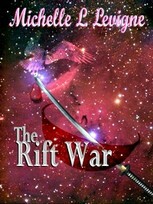 Mrillis watches both daughters of the Warhawk as they grow up and choose the paths of their lives. They could be part of the fulfillment of the prophecy of the Three Drops of Blood–but which one will wait, and which one will abominate? The choices the sisters and their teachers make could affect the destiny of the World for centuries to come. Raised in hiding, Athrar Warhawk emerges to claim his place and destiny as Warhawk's Heir. Guided by Mrillis and Meghianna, supported by his foster-brother, Lycen, Meghianna's adopted son, he tries to hold the alliance together as rebels and traitors fight for dominance. Young love turns to betrayal and loss, made worse by the political games of court and a growing schism between Noveni and Rey'kil. When Athrar finds his soul-mate, traitors and politics try to tear them apart, and magic tries to force her to betray him with Lycen. A new prophecy emerges, speaking of the Lady Warhawk, promising sorrow and hope for the future–even as the Nameless One emerges from hiding and begins his final campaign of destruction. Mrillis and Meghianna risk all to protect the defenseless thousands who have fled to Moerta, and in so doing lock the defenders in with their enemy, for all time. Only the Lady Warhawk will hold the key to the future, and to freedom. Awakened from magical sleep, Emrillian Warhawk grew up in the modern, technological world of Moerta, 2000 years away from Quenlaque and Lygroes. There, the legends of Athrar Warhawk and Quenlaque, Braenlicach and the Zygradon were nothing but fanciful tales warped beyond all recognition. Raised by Mrillis the enchanter, she knew the truth, and sought out friends among the Archaics, who believed in the promise and prophecy of Quenlaque and the return of Athrar. Only they had access to star-metal, the Threads, and the magic of the Rey'kil. Then the authorities threatened their sanctuary to confiscate star-metal to use in weapons of war. Emrillian and Mrillis fled back to Lygroes through the tunnel under the sea, accompanied by Grego, a friend with inborn magic who had sworn loyalty to Athrar and Quenlaque. In Lygroes, where only 200 years had passed, they joined forces with Baedrix, descendant of Lycen, and prepared for the awakening of Athrar, the dismantling of the dome of Threads that kept Lygroes hidden from the modern world, and the final battle with Edrout, son of the Nameless One. With the help of Archaics who crossed to Lygroes and awakened their own inborn magic, Emrillian, Baedrix, and Grego set out to retrieve Braenlicach from hiding and find the lost Zygradon to heal and awaken Athrar. Time was their enemy as Edrout gathered his forces and armies from the modern world surrounded them -- and failure could mean the destruction of the entire world.